This news article from 1900, like the account reported by F. Roy Johnson in his 1963 book "The Fabled Dr. Jim Jordan," demonstrates the tacit acceptance -- if not approval -- given to the practice of folk magic in African American denominations of the Baptist Church. In both cases, a church committee was convened to discuss the use of hoodoo within the church. Because this unknown author used terms unfamiliar to modern readers and employed words in ways not commonly found in the modern literature of hoodoo, a few explanatory notes have been added [in brackets]. MATAWAN, N. J., April 1.- The congregation of the Second Baptist Church of Keyport [New Jersey] has been stirred up during the past week, apparently being pursued by a hoodoo. Bad luck seemed to follow the church and congregation, and finally charges were made against Charles Jenkins, a member of the church, for accusing the pastor, David D. Hill, of carrying a hoodoo about with him in his traveling valise. 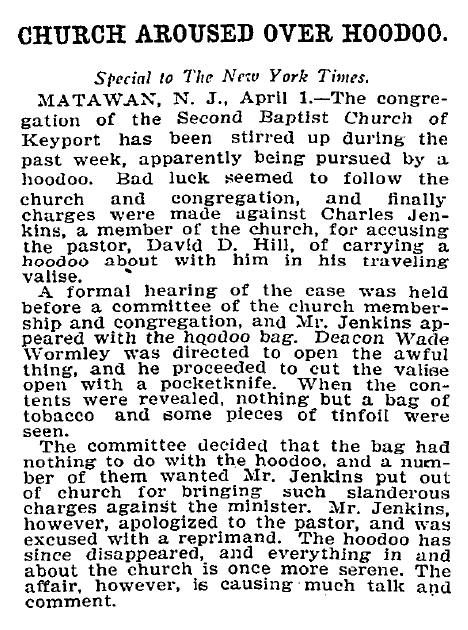 A formal hearing of the case was held before a committee of the church membership and congregation, and Mr. Jenkins appeared with the hoodoo bag. Deacon Wade Wormley was directed to open the awful thing, and he proceeded to cut the valise open with a pocketknife. When the contents were revealed, nothing but a bag of tobacco and some pieces of tinfoil were seen. The committee decided that the bag had nothing to do with the hoodoo, and a number of them wanted Mr. Jenkins put out of church for bringing such slanderous charges against the minister. Mr. Jenkins, however, apologized to the pastor, and was excused with a reprimand. The hoodoo has since disappeared, and everything in and about the church is once more serene. The affair, however, is causing much talk and comment. [Keyport is a small town on Raritan Bay in Monmouth County, New Jersey, United States; the Black population is less than 10%, hence the White author of this piece took a somewhat tongue-in-cheek attitude toward the events described. The Second Baptist Church of Keyport is still in existence, located at 205 Atlantic Street, Keyport, NJ, and serving the African American community. 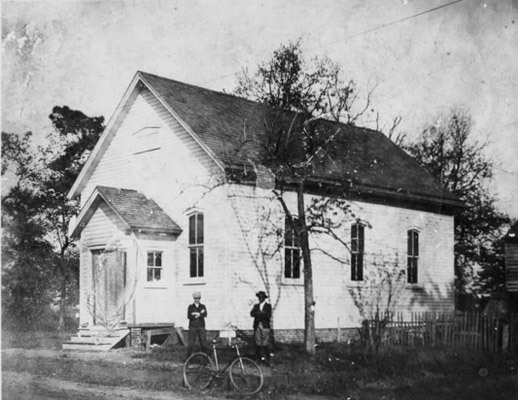 The picture above, taken from the church's web site, shows the appearance of The Second Baptist Church of Keyport in 1900, at the time this article was written.] .